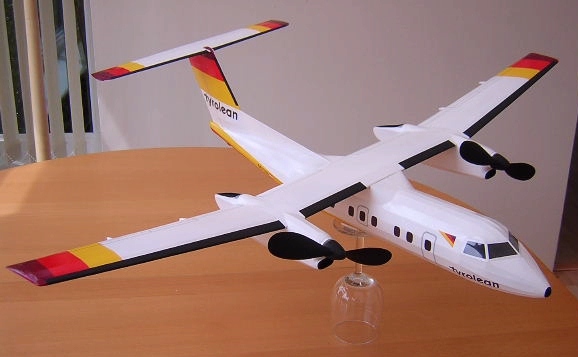 After Seeing Chris Starleaf's marvellous twin rubber powered Dash 8 airliner, I could not resist building one myself. Chris was kind enough to send me a copy of the plan, and I started the day it arrived. Needless to say after an initial burst of enthusiasm, progress slowed considerably, but still crept along. Anyway, at long last it is finally finished. Wingspan is 32" and weight without noseweight or rubber 62 grams. Considering the amount of paint on the thing, I am very happy with this. 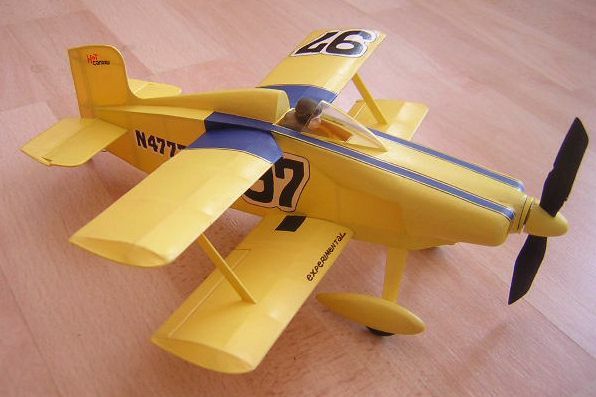 Props are two 7" Pecks with laminated balsa spinners - they both rotate the same way. 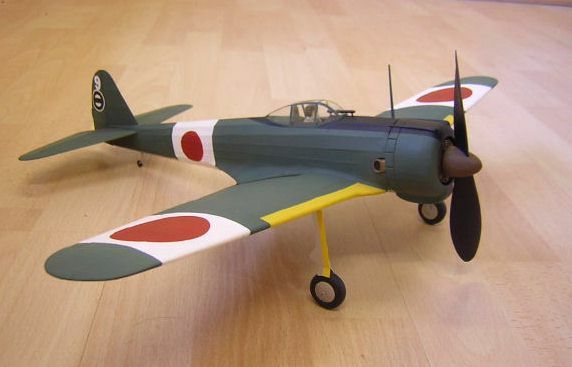 This is a one-piece model to keep it light, but a knock-off wing could also be rather dangerous, as a spinning prop could make a right mess of the fuselage stringers when the wing came off. This photo gives you an idea of the light structure Chris designed, and the wing panels are made using the cracked rib method, which saves cutting out any ribs from sheet. I also think on this aircraft it helps the appearance, as the ribs are generally invisible under the painted tissue. The model was airbrushed entirely in Humbrol gloss enamel paints thinned with dope thinners. You can see in this view that there was some tricky masking to be done on the rear fuselage. 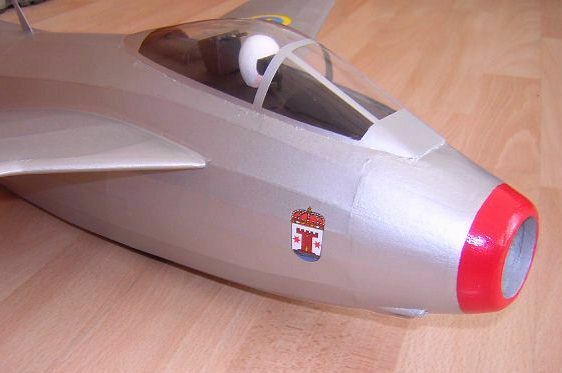 I approached the finishing on this model in a similar way to the plastic airliner kits I used to make, which I always did in a pristine "factory fresh" condition. Not the way airliners usually are, but I just like them that way. The de-icer boots were outlined in strips of black-painted decal sheet, then filled in with a brush later. 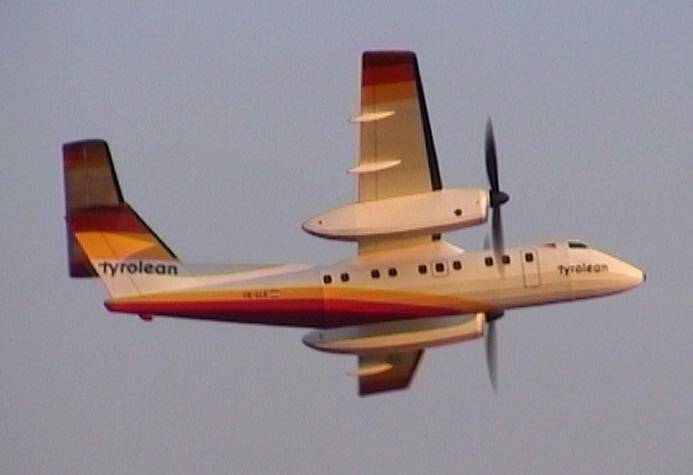 Tyrolean titles are home made decals, as are the cabin windows, registrations and P&W logos. Other markings, including the door outlines, are pieced together from painted decal sheet. All control surface outlines are cut from black lines printed onto clear decal sheet. This is made possible by the gloss white waterproof surface of the model, and I suppose is equivalent to adding strips of black tissue to a model finished with coloured tissue. I like the way you can adjust the position before allowing it to dry. With a lining pen mistakes are harder to correct, and they do not always wet a gloss surface very well. We had an unexpectedly calm and even slightly sunny evening a few days after the model was finished (May 2005), so I went down to the field at Hungerford with my friend Laurie to have a go at trimming it. One great thing about this field is that the grass is quite long, except for the mowed strip for the RC lads. You would have to pile in pretty hard to cause any damage to a model. 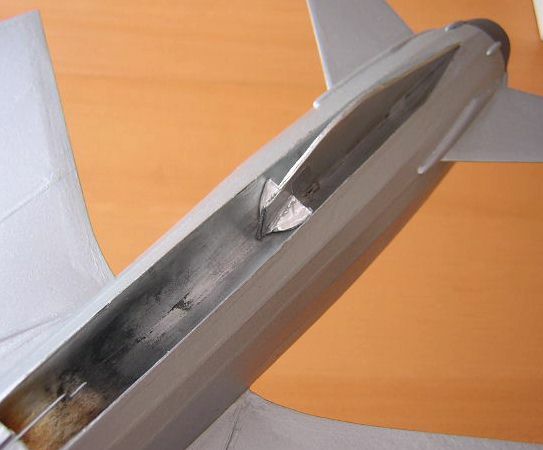 I added 6 grams of lead shot to a compartment I had built into the underside of the nose to get the balance point approximately on the wing spar. Rubber was a loop of 3/16 tan sport in each nacelle, just under 2 times peg to hook distance. The glide looked good straight off, so I put on 200 turns, and off it went dead straight gently climbing and steady as a rock. A marvellous start, and a good sign that the model had been built warp-free. With 400 turns it showed a slight inclination to turn left from the launch, but then went straight again. There was a slight stall evident, so I tweaked the centre of the hinged elevator very slightly down. Too much actually (it is very sensitive) so the next flight was a low level strafing run! So, I corrected back slightly the other way, and also added a small acetate trim tab into a slit in the fin trailing edge and bent if left. It is worth mentioning here that I built in a bit of down and right thrust into each nose button when I made them. Next flight with 400 turns gave 3/4 of a large left hand circuit. I built up the turns 100 at a time and the last flight of the evening had 800 winds on each motor. This gave a great 30 second flight with two full circuits and it looked fantastic as it circled overhead. I found I needed no thrust adjustments at all - no power stalling was evident. Needless to say I went home extremely happy. Obviously there is more to come. For a start, there was no trace of any motor bunching, so I am sure I can use longer motors. Here are a couple of in-flight shots taken on a second outing a couple of weeks later on a nice sunny evening. 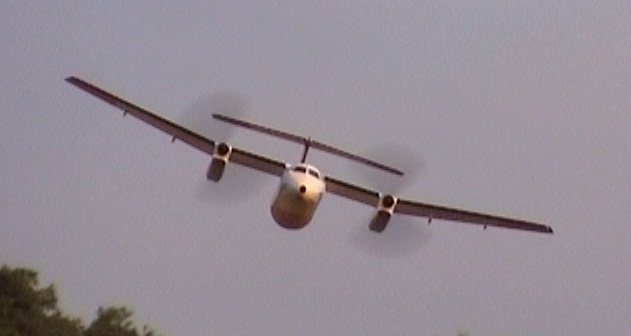 I have also rendered a movie of one flight in MPEG format which you can download or view here. File size is 2.4 MB. To save on your computer, right click and choose "save link as". Thanks to Laurie for manning the camera. I was still using the relatively short motors, so just under 2x peg to hook distance, and 800 turns. With motors double the length, which should be OK for single loops of 3/16" rubber, I should be able to get it stay up for twice as long - so heading for a minute. I also think it would probably gain more height if I opened out the turn a little. Probably best to wait for a bigger field before trying that though! I have got say - it is a great design, which really did fly off the board. It looks very stable and never showed any tendency to drop a wingtip or anything - it just cruised steadily around. It is a couple of years since I got such a kick out of flying a new model. My first rubber twin that actually flies, and I owe a big thank you to Chris Starleaf for making it possible. 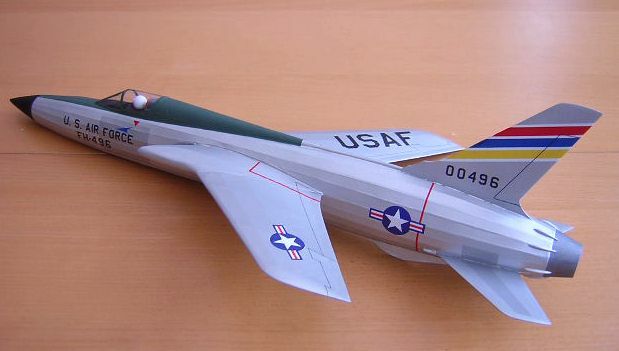 I had thought for a while that a Thunderchief would make an attractive subject for a Rapier-powered model, but was put off by the underfin, which was right where the trough ought to be. Then I saw Steve Bage's Mig 21 design where he simply put the ventral fin in the trough, and protected it with aluminium foil. 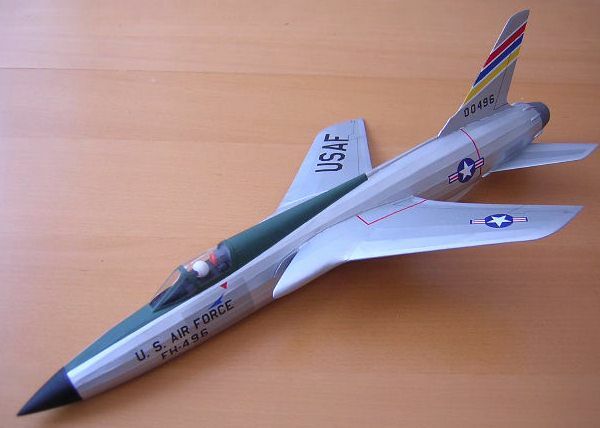 I floated the idea of Steve designing a Thunderchief, which he was very keen to do, and the result was the excellent plan from which this model was built. Wingspan is only 10.5 inches, but it is 19 inches long. With careful wood selection I was able to keep the finished weight down to 26 grams, without motor and before adding trimming ballast. Covering is my usual White Esaki, and the silver finish is Xtracolour RLM 01 Silver enamel thinned with dope thinners. All the markings are either home made decals or cut from painted decal sheet. The solution to this has proved to be the addition of a small deflector tab in the motor trough to give a bit of downthrust. This allows the model to be flown with a much more floaty glide so the trim change between powered flight and the glide is much less. This model is the first to be finished of the pair of 1/24 scale Diels Engineering designed Oscars I have been building. 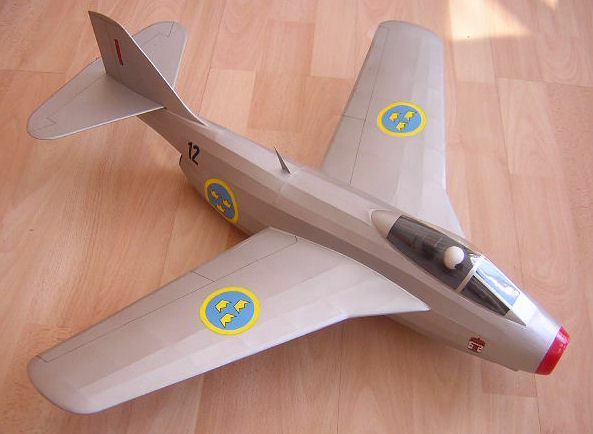 I made some changes to the kit design on this one, namely making the fin and tailplane streamlined with separate control surfaces, also hinged ailerons. you can see this in the photo below. The finish is all airbrushed Humbrol enamels, thinned with cellulose thinners. 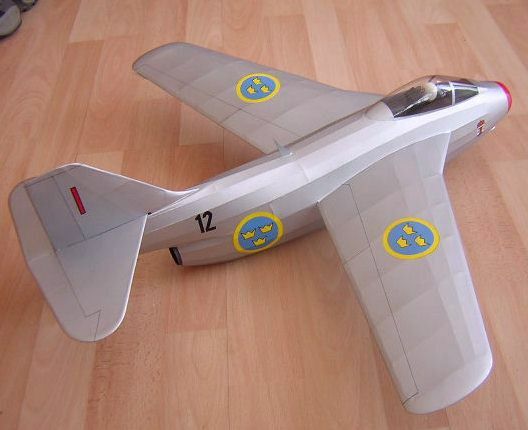 There are no home made decals on this model, though the wing walks and tail logo are cut from black painted decal sheet. The weight came to 28.5 grams, which does not sound too bad until you realise just how much nose weight was then needed to get the centre of gravity in the correct place. 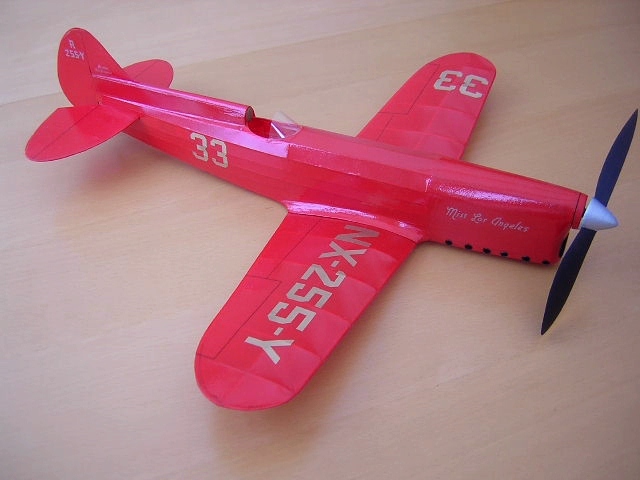 The Oscar does not have a very long nose, and I really paid for the extra structure I had put in on the fin and tailplane. Suffice to say, the weight has moved now to over 35 grams. One of the trickiest bits of the model to construct was the annular radiator inside the cowling. I ended up fabricating it from plastic card, mounted on a circular backplate. It had to be mounted to the removable nose plug, so might start looking a bit odd it I need more downthrust. 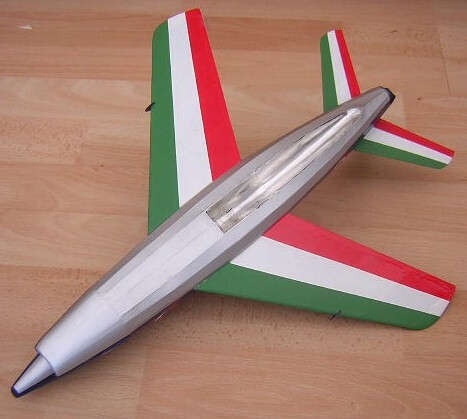 To make the exhausts look more realistic, I made an aperture in the fuselage, and laminated some 1/8� balsa onto the back of the kit supplied exhaust. After careful shaping, it was mounted into the aperture, so it now looks like it is coming from somewhere, rather than just stuck on the outside. Initial flight trials were done indoors during the BMFA indoor competition in Birmingham (sensible, eh?) and it was a bit tricky to keep it away from the walls. I managed to break a leading edge and mash the spinner. The best flight (as usual) was between sessions when the judges were not watching. However, it did fly, and I got one qualifying flight from a hand launch. I think I need to spend a bit of time playing with it outdoors to get a feel for what it is capable of. 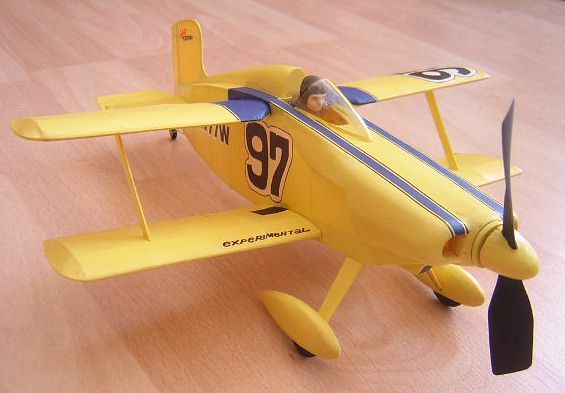 After the problems getting my Pistachio He 112B to fly properly, I thought that my best chance of success might be to build a peanut sized pistachio model, and the Hot Canary racer fits the bill. The fuselage is close to the size of my peanut Fox Moth, yet it has a wing span of just 8 inches. 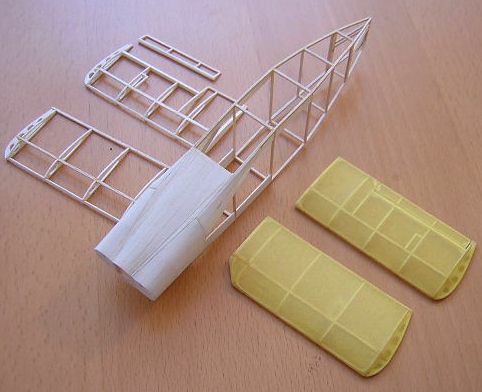 The wing area is still reasonable though, as it is a biplane. Unusually, it features reverse stagger, so the upper wings sit behind the lower ones, attached directly to the fuselage. 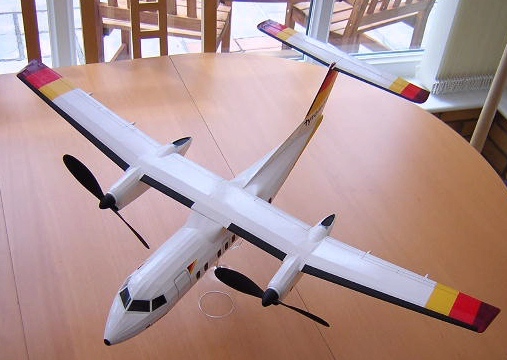 The model is based on the old Model Builder peanut plan, but scaled down to just 8 inch span. 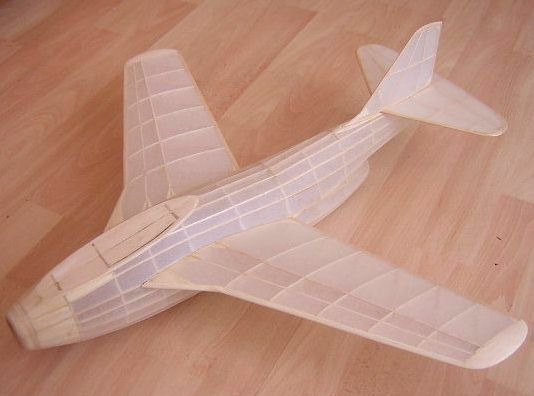 The real plane has a span of only 14 ft 9 ins, so even at Pistachio scale it is still around 1/22 scale. Most structure is 1/20 sq. 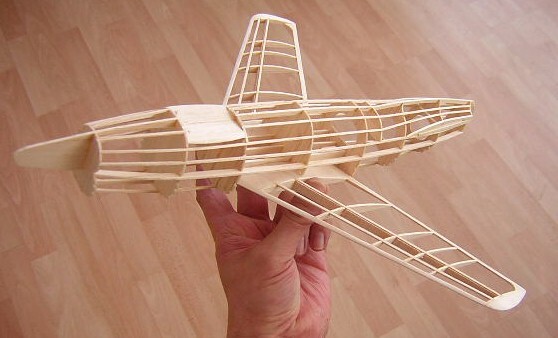 balsa. 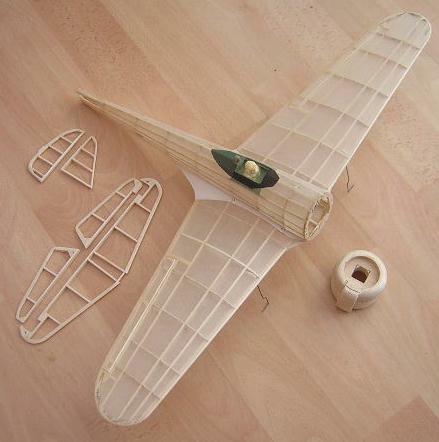 The sheeting round the front is soft 1/32� balsa sanded down until you could see through it. 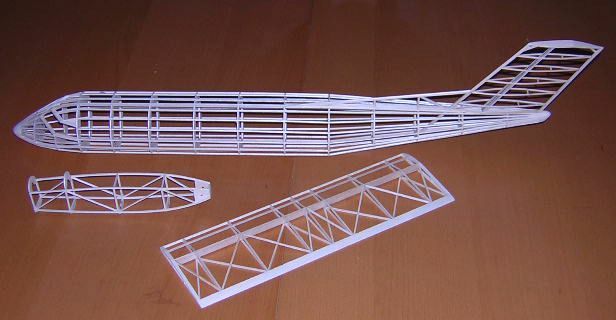 Ribs and formers are 1/32� sheet. Covering is yellow Esaki tissue, airbrushed with yellow enamel thinned with cellulose thinners. 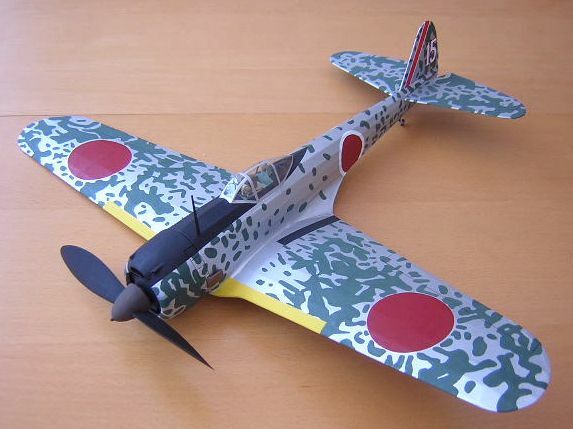 Most markings are home made decals, or cut from painted decal sheet. Final weight was a hefty (for a Pistachio) 9.5 grams. The model, not surprisingly, came out nose heavy, despite the plastic prop being scraped to within an inch of its life. This meant I had the luxury up using some up elevator during trimming. It was finished the week before the 2006 BMFA indoor nationals, and initial hops in the garden had been inconclusive. Thus trimming had to be attempted during the competition. Unfortunately despite three sessions to try and get a flight, I failed totally. With the prop removed and replaced with a blob of clay, the glide looked reasonable, but under power it just looked hopelessly unstable. At least it survived intact, so lives to fly another day. I will let you know if I ever get it sorted! 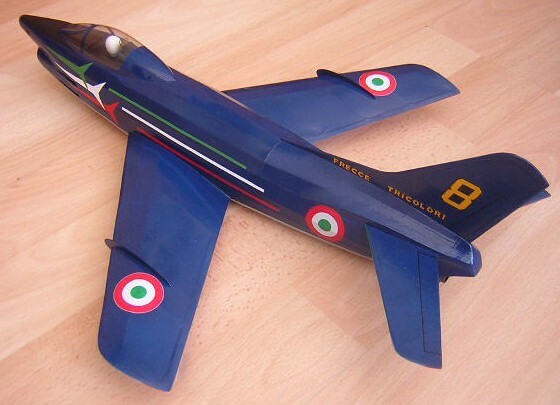 I always thought the Fiat G.91 was a very pretty jet, and thought it would make a good free flight subject, with the added attraction that I did not think anyone had done it before. There are some subtle contours on the fuselage that were tricky to get looking right, especially round the nose and tail, but I think it has come out looking reasonably accurate. The plan took rather longer to draw than my jets usually do, and I had to keep correcting and adjusting the drawings as the model progressed. 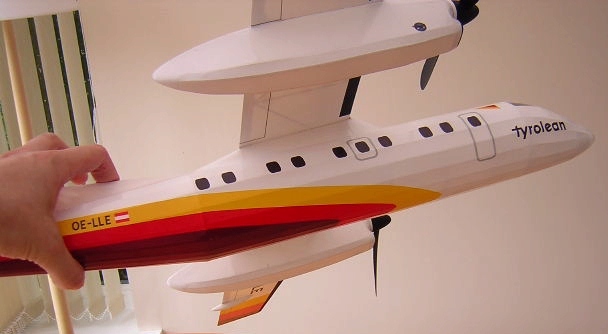 The only intentional deviation from scale is the slightly enlarged tailplane. 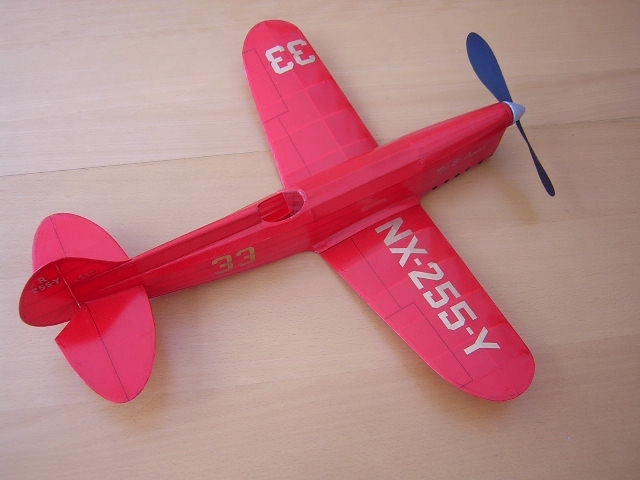 Wingspan is 13 inches, and I hoped it would fly with a standard Rapier L2 motor. The wings are mounted to the sides of the jet trough, then sheeting added around the roots, which makes them very strong. 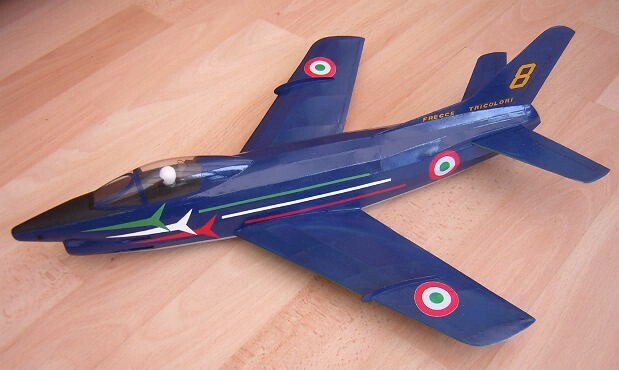 Because I wanted to finish the model as one of the colourful Frecce Tricolori aerobatic team aircraft, I covered the upper surfaces with blue Esaki tissue, and the lower surfaces in white. I hoped this would minimise the amount of paint I had to add later. The paint finish is my usual Humbrol enamels thinned with cellulose thinners. 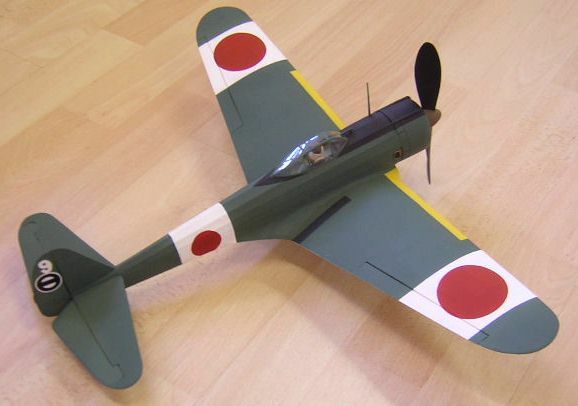 The fuselage markings and canopy framing are all cut from painted decal sheet, and the fin markings are home made decals. Total weight without a motor was 23 grams, which was very pleasing. First flights took place at the Old Warden Aeromodelling weekend in May 2006. As usual, a small drag tab was needed on one wingtip trailing edge to straighten the glide as much as possible, but no nose or tail weight seemed to be needed. The first flight was with an 80 mN rated Rapier L2 LT, which had enough power to give a very pleasing sortie, with the model settling into a wide right circuit and gently climbing. This was followed by two flights using 110 mN rated standard L2 motors, which showed a similar flight pattern, but gaining a bit more height. 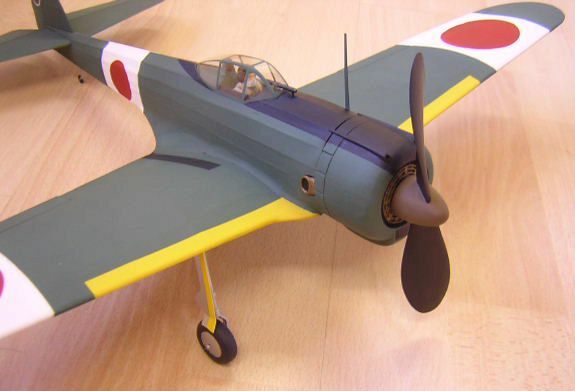 The model looked very stable and showed no tendency to drop a wingtip. I guess this is as close as you can get to flying straight off the board. This is my fourth Tunnan, and the biggest so far, at a substantial 23.5 inch wingspan, to suit the latest batch of Rapier L3 motors, rated at 300 mN. The size was a bit of a guess, but I was hoping for an empty weight (no motor) of 60 grams. 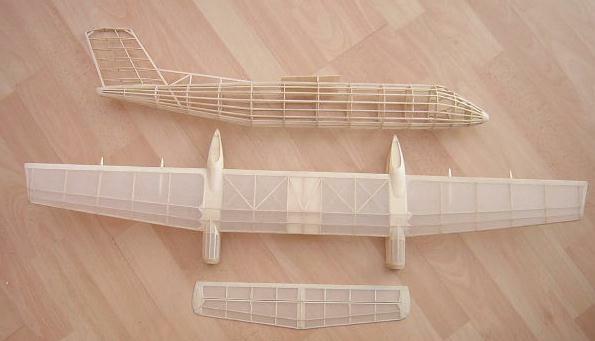 It is based on the 12.5 inch version, but with a couple more fuselage formers added, a few more stringers where the gaps were biggest, and redrawn wings, with two spars and two extra ribs. 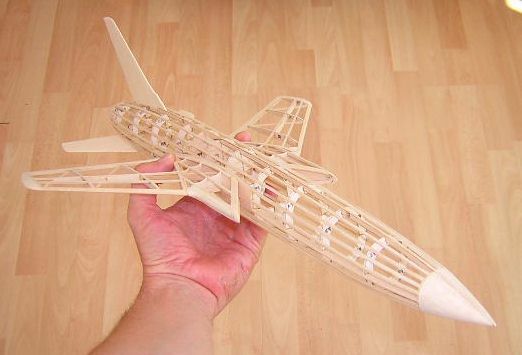 Most of the structure remains 1/16" balsa, but the stringers are 1/16 x 1/8" (to reduce the risk of starved horse syndrome) and the tailplane is 3/32"thick. No movable surfaces were included. There was plenty of scope for reducing the width of the trough, but I decided to leave the proportions unchanged from the smaller model, on the basis that if the L3 motor did not work, I would have enough space to put in two L2 motors instead. I also added a substantial brace in front of the motor tube to prevent it shooting forwards inside the fuselage in the event of a vertical arrival (something that claimed my last two Tunnans). The model is covered in white Esaki, and finished with an airbrushed coat of Xtracolour RLM Silber enamel, thinned with dope thinners. All markings are home made decals. The badge on the nose was printed onto white decal film, which was cut out and applied. When dry, a second decal printed on clear film was placed over the top to tidy up all the edges. Weight without motor, but with nose ballast, came out to 56 grams. 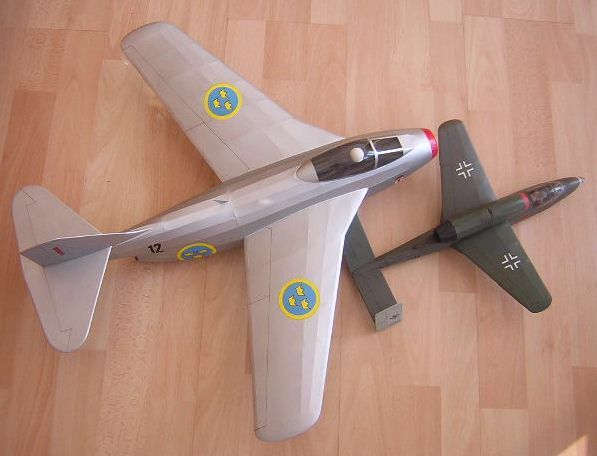 Considering the bulk of the model (see comparison shot with my Rapier L2 powered Heinkel He 162 below) I was very happy with this. It has flown again since painting and has continued to fly well, though you cannot have too tight a turn under power or it will tend to spiral gradually earthwards towards the end of the power run. Maybe I should have made it a couple of inches bigger! Here is the other Diels Oscar, the short span Mk.2, finally finished in June 2006. As well as having a reduced wingspan, the cowling and canopy are also a different shape to the mark 1 above. This one was built pretty well straight from the kit, with very few changes, and using the (excellent) kit wood. No undercarriage was fitted. You can see here how the whole cowling has been filled in with soft balsa sheet between all the stringers It came out lighter than the other, more detailed Mk.1, but still needed a hefty amount of noseweight. 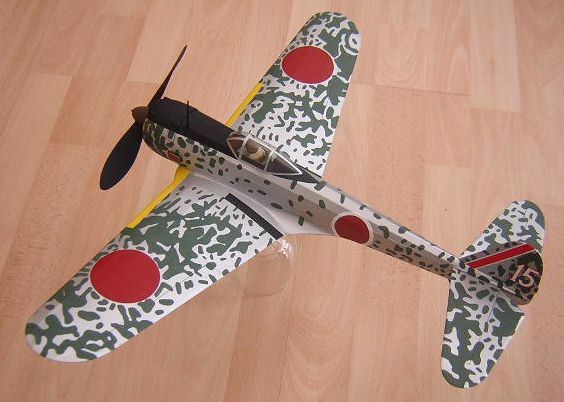 The model was first airbrushed with Xtracolor RLM Silber enamel, thinned with cellulose thinners (dope thinners), then I added the roundels (from the kit decals) before hand painting the green blotches, as they seemed to be applied around the markings on the original. The prop is a 6 inch Czech one I got from Flitehook, and the spinner laminated balsa. Brown B-2 Racer "Miss Los Angeles"
This was built specially for the 2006 Flying Aces Nats to attempt to qualify for the Greve Trophy. The design is by Tom Nallen, and was included with an old issue of Flying Aces News. Wingspan is 18 inches, with a nice long fuselage to get plenty of rubber in. 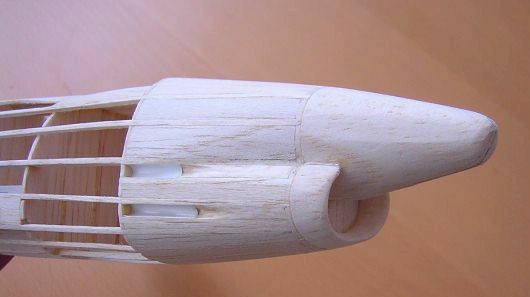 One thing I did change from the original design was to add some fuselage stringers, as I had read that judges were going to be strict about enforcing the "no slab sided models" rule for mass launch events. I also sheeted in the engine cowling. To aid transport to the USA, I did not glue the wing in place, but held it on with a pair of rare earth magnets, which worked very well. The model was covered with red Esaki and then airbrushed with Humbrol gloss red enamel. The model is really a much brighter red than it looks from the photos. 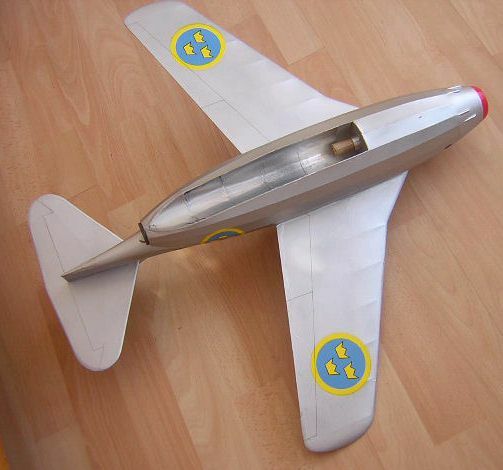 The gold lettering was cut from spray-painted decal sheet, apart from the tail registration and nose lettering which are home made decals. 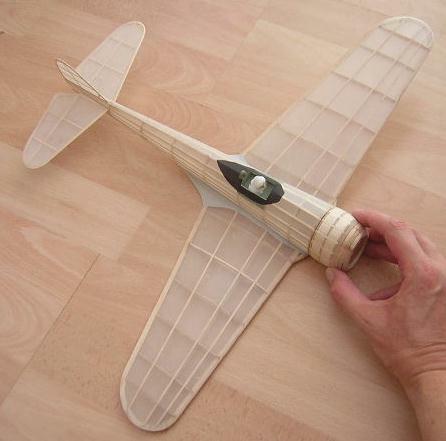 Up front is a 7 inch Peck prop with a carved balsa spinner. I trimmed the model out just about in time to record a score for for the Shell Speed Dash on the first day of the competition, which is the qualifying event for the Greve and Thomson trophies. Despite the long nose, I still needed some noseweight, bringing the all up weight to 34.5 grams. The model proved to be very sensitive to rudder position, and I got the best flights starting off with a right turn, which then changed to a left turn as the motor ran down. Using a motor with four strands of 1/8" rubber, it climbed rather impressively, and I got a best flight time of 60 seconds. I would normally have been thrilled to bits with that, but with this being the Flying Aces Nationals, I missed the qualifying cut-off by a considerable margin!